Italy has agreed to provide funding and insurance coverage for industrial, construction and infrastructure projects worth $2 billion in Iran which hosted the latest European delegation after the conclusion of nuclear talks. An MoU was signed between Italy’s investment bank Mediobanca along with its development ministry and export credit agency SACE in Tehran Tuesday with Iran’s economy ministry and central bank. In a statement, Mediobanca said the aim of the agreement was "to facilitate future economic and commercial relations between the two countries". An Iranian official said the MoU will be executed upon the removal of the sanctions, with Mediobanca providing credit and SACE insurance for projects in Iran. “The value of the agreement is $2 billion which we hope to implement soon,” Italian Economic Development Minister Federica Guidi, who accompanied the delegation, told reporters. Italy remains one of Iran’s main commercial partners despite a steep decline in trade because of the sanctions. According to SACE, oil and gas, automotive, defense, transport and real estate offer the best opportunities for cooperation. Annual trade stood at $7 billion before sanctions slashed it to $1.5 billion, Iran’s Economy Minister Ali Tayyebnia said. In their discussions, the two sides agreed on expanding commercial transactions, especially investment in Iran and promoting relations, he said. According to SACE projections, removal of the sanctions against Iran could lift Italian exports to Iran by $3.3 billion in the next four years. Guidi said Italy will certainly invest in Iran's car industry in near future. "The number of cars produced in Iran is high and this will not be limited to Iran's market," he was quoted as saying by the IRNA news agency. The two countries also agreed on raising imports of oil by Italy from Iran and using new opportunities for joint investment in the exports sector, Tayyebnia said. 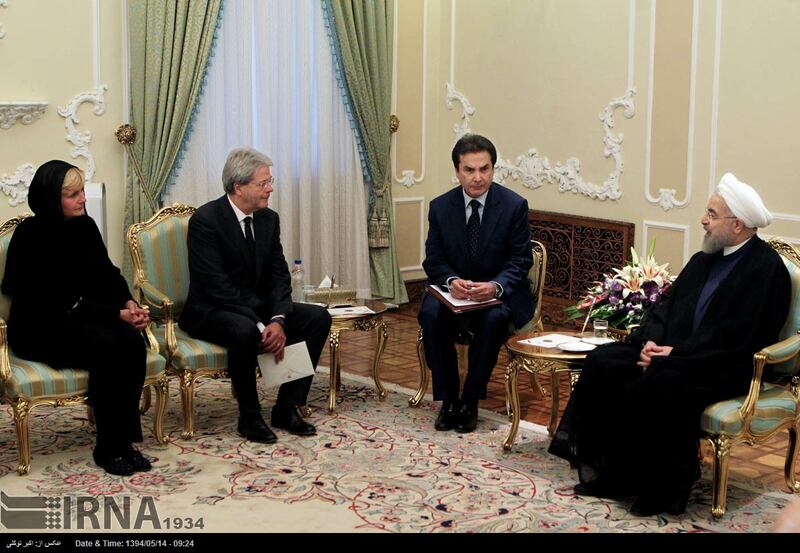 Foreign Minister Paolo Gentiloni led the Italian political and economic delegation on the visit to Tehran. They followed in the footsteps of officials from France, Germany and Serbia. German Economy Minister Sigmar Gabriel was the first senior European official to visit Iran at the head of a large delegation after the conclusion of nuclear talks last month. French Foreign Minister Laurent Fabius traveled next to hold important talks with Iranian officials. Spain and Switzerland are next to send their representatives for trade and financial negotiations.